16251.213 Charles Pishon 8 BIGELOW, son of Joshua Cushman 7 ( James 6 , James 5 , James 4 , Jonathan 3, Joshua 2, John 1), and Eliza (PISHON) BIGELOW, was born at Norridgewock, Somerset co., ME on 21 August 1828. He married Maria Louisa Tobey on 07 September 1854. She was born 30 July 1830. This family lived and farmed in Norridgewock, ME and were enumerated there on the 1880 and 1900 censuses. Charles died 22 February 1910. Maria had died in 02 November (December?) 1908. You will note that there are conflicting dates for birth of Ida Maggie, child of Charles and Maria Louisa - compared with burial details also given. 1900 census also lists Thelma A., b May 1897 and Harry T., b Sept 1899 in the household, possible grandchildren? We have located the graves of a group of Bigelow in the 3 cemeteries in or near Norridgewock. I found Joshua Tobey Bigelow son of Joshua Cushman he is burried in Norridgewock along with his two wives. 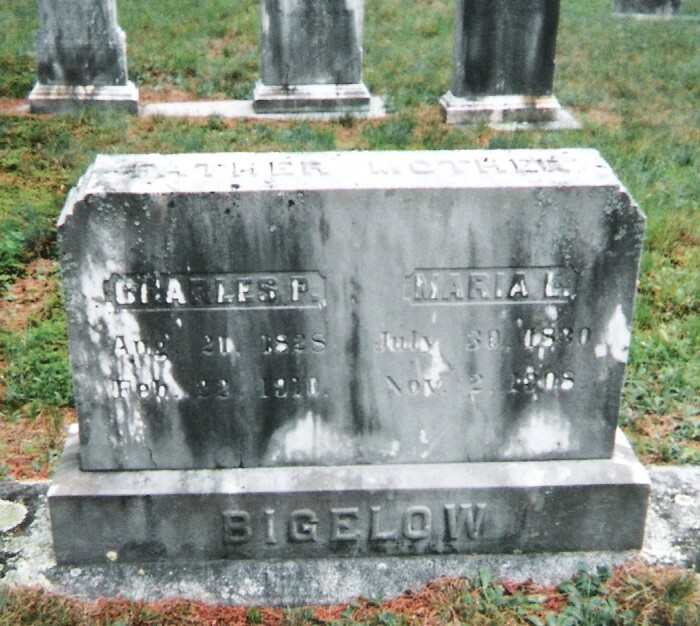 Also buried next to Charles Pishon Bigelow and his wife Maria is their daughter Lizzie and her husband Edwin. I did not get the dates from the stones just their locations. Will follow up on that.